This webinar was co-hosted by ASTC and the Visitor Studies Association (VSA). Do you know what your visitors are really doing in your exhibitions? What you imagine or assume might be way off from what the actual data shows. In this live webinar on April 27, we walked through an imaginary exhibition and tracked and timed ourselves. We found out if our imaginary data looked like a real sample of visitors—where they went and how long they stayed! 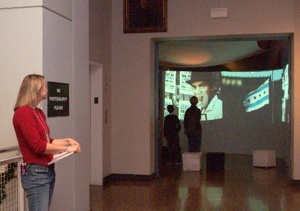 Tracking and timing (T&T) is one of the oldest and most commonly used methods for conducting summative evaluations of museum exhibitions. 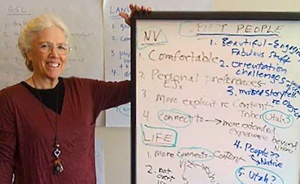 The session was led by Beverly Serrell (one the foremost experts—and literally the woman who wrote the book—on T&T) in a fun, participatory learning experience that revealed the benefits as well as the limitations of T&T. 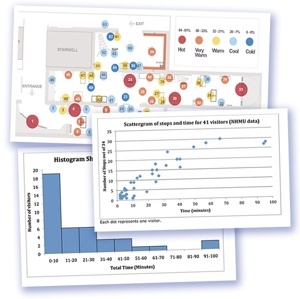 Webinar participants saw how visitor behavior data moves from an observer with a data collection device, through a spreadsheet for numerical analysis, to the software for making histograms, scattergrams, and heat maps that display the data. During this 90-minute webinar, Serrell also discussed her efforts to establish and work with large sets of data from numerous T&T studies—enabling researchers to compare visitors’ experiences and examine broader patterns across various sites and exhibitions—and to help researchers answer questions often posed by stakeholders, e.g., what are visitors doing and why? discovered the value in creating an in-house database of findings from T&T studies for comparison and planning purposes and learn more about other sets of data that can facilitate comparisons with exhibitions at other institutions. Audience: This webinar was designed for museum and cultural institution evaluators, educators, and advocates for data collection and evaluation. Fee: $25 for ASTC/VSA members; $35 for nonmembers. The fee included exclusive access to an archived recording of the webinar and a digital badge/certificate for participating in the live webinar.